In 2001 Heyne Verlag was bought by Ullstein Econ List (owned by Springer) and became Ullstein Heyne List. In 2003 Springer and Randomhouse Verlagsgruppe agreed terms for their acquisition of Ullstein Heyne List, subject to approval by the German monopolies committee. Approval was given on the condition that Random House sold off the Heyne fantasy list to Piper, causing unforeseen contractual complications for them. Random House also divested itself of the Ullstein Econ List and Marion von Schroder imprints to Piper’s owner, Bonnier. The cover of the Heyne edition contained the infamous Maggi soup advert in the body of the text (a method of gaining additional revenue for that company not passed on to the author – whether or not they would have agreed to the idea), that caused Terry to move publishers as soon as his contract with Heyne permitted him to do so. 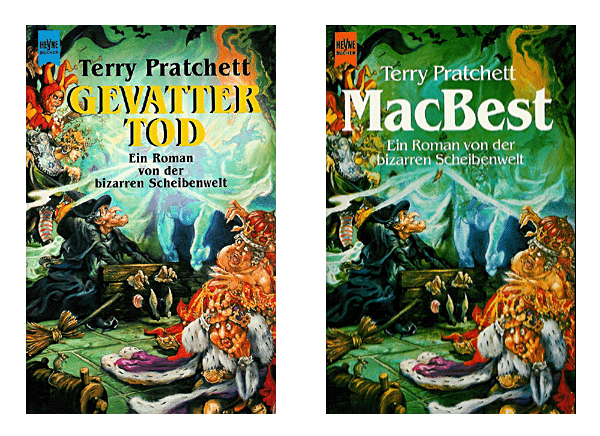 For some incomprehensible reason Heyne decided in 1995 to change the cover of their edition of Mort – Gevatter Tod – and replace it with that for Wyrd Sisters – Macbest. They then asked for a replacement illustration for that, which was refused. Heyne, with their usual disregard at that time for using appropriate cover designs, used Josh Kirby’s cover illustration for James Corley’s Benedict’s Planet (Elmfield, 1975). This was first published with a detail from Josh Kirby’s picture ‘Valentine’s Arch’ on the cover. This had been painted for one of Robert Silverberg’s Majipoor Chronicles books, but never actually used. 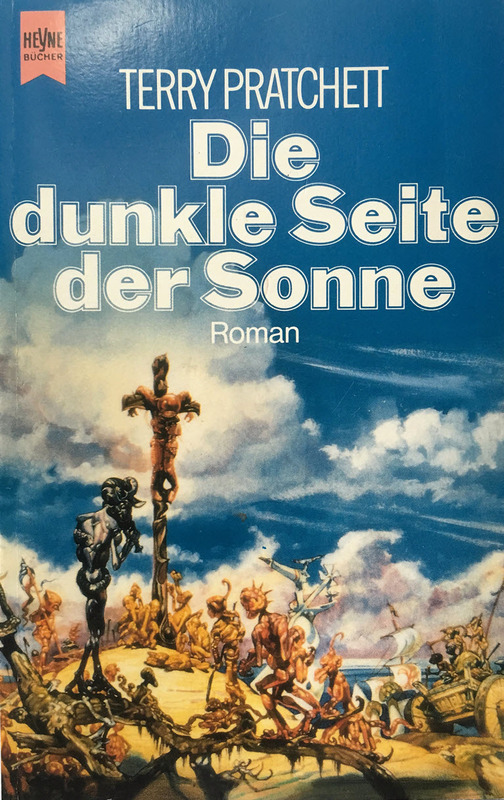 This book was described by Heyne as the first volume in the Discworld series, presumably because Goldmann had already published The Colour of Magic (which Heyne only later issued in 1992 when that licence terminated). For their cover illustration of this book, Heyne first used a detail from ‘The Arrival of the Ark’ from Josh Kirby’s The Voyage of the Ayeguy series. This was only corrected on their 2000 printing. 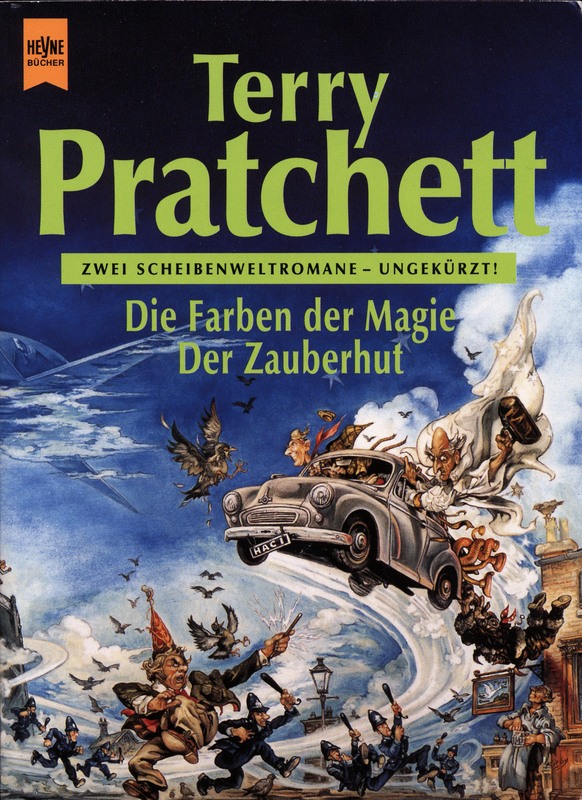 Because they had not yet published an edition of The Colour of Magic, Heyne called this the second in the Discworld series. 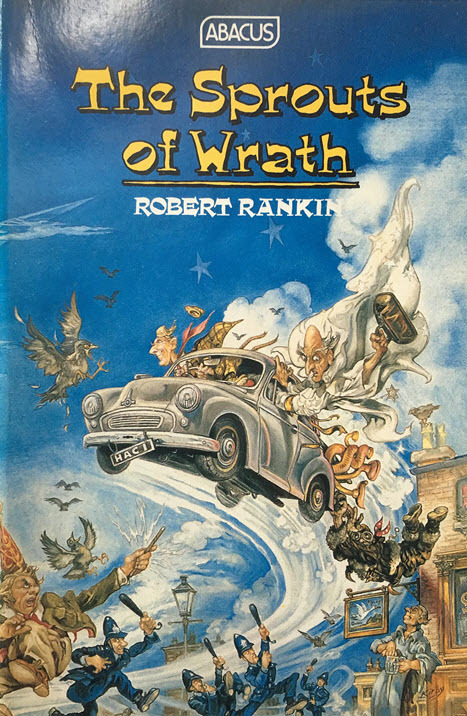 Using a cover illustration painted for Robert Rankin’s The Sprouts of Wrath, complete with English policemen, a Morris Minor, part of a gasometer and other uniquely English images. On being reproached for its use, Heyne maintained that this was not a breach of contract as they considered it to be of a relevant subject to the book (possibly because it also contained a man with a pointy red hat). Heyne first published this title in 1989 using as the cover illustration a detail of ‘Death of a Spaceman’, another of Josh Kirby’s paintings from his Voyage of the Ayeguy series. Heyne got round to using the correct image on their 1998 printing. One wonders what relevance they thought a crucifixion scene had with the theme of this book.